You will see kitchen islands in about every newly designed home. The counter, storage, and seating space you gain by adding an island is a benefit no one can pass up when designing a new kitchen. Instead of just using your island as extra counter space, it can be used for a number of other purposeful things! Turn your island into a space that is completely functional. Gather your family around the island so you can cook, clean, and entertain at the same time! Want to cook and talk to your guests at the same time? Instead of having the stove where you have to cook facing the wall, place your stove top in the island! This gives you access to talking to your guests face to face while cooking. Not only can you put your stove in your island, but you can put your oven in there as well! You will give yourself more lower cabinet space around your kitchen by putting the oven in the island too. Personally, I love this idea the best! Make your island into a cutting board. You can design a butcher block island to cut right on top of. You can make your entire island a butcher block or a portion of it. Either way, this makes cutting up vegetables a whole lot easier. Cooking now becomes the center and heart of your kitchen! Do you have a little kitchen? Are you trying to lay it out the best way you can? For functionality, placing the main kitchen sink in the island is a must. By placing the sink in the island, you save so much room on the wall for other important kitchen items such as cabinets, a refrigerator, or a stove. Also, think about how much time you spend at the sink. Do you want to be facing a wall or your company? This is the best place to put the main sink so that you can talk to your family while doing daily kitchen duties. Instead of having the island as extra countertop space, make it a place for people to comfortably sit. Picture the family gathering around the kitchen island for breakfast, lunch, dinner, dessert, snacks, you name it! The island is a place where children can do homework, you can do office work, or just a place for people to sit to enjoy your home cooked meals. A great look is to have a step-up counter top for you to put barstools under. This give you space to use the counter top and a separate space for people to come and eat. If you have a longer kitchen, you can extend the countertop towards the end with open space underneath. This way you can place chairs on all three sides of the island for ample seating. Whether you are using your island to cook, clean, or gather the family for dinner, it’s a great space for tons of possibilities. An island helps you to use more wall space and make the space you have more functional! 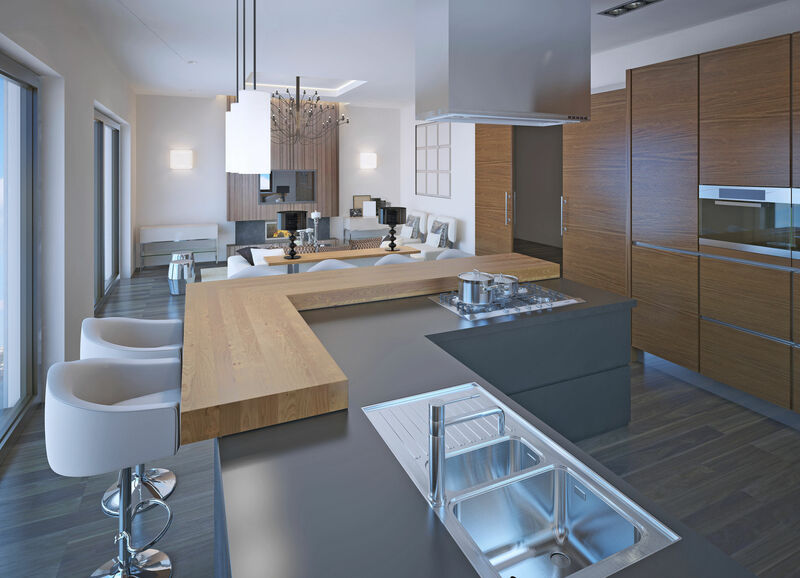 If you are designing a new home or remodeling your kitchen, be sure to implement one of these designs into your island!